Chad Wackerman is a gracious host and shares willingly (including authorship). Although he starts his album with a mellifluous and spacious solo percussion track, he really has nothing to prove—no pyrotechnic drumming meltdowns required. He has collaborated with and provided support for the best: Frank Zappa, Allan Holdsworth, James Taylor, and many others as a session musician. He has toured with his own Chad Wackerman Trio (Doug Lunn, bass and Mike Miller, guitar) as well as conducts drum clinics. Chad has chops, but doesn’t feel the need to shove it to the front of the mix. On “DNAI”, the album players include: Chad (drums and percussion), Allan Holdsworth (guitars, Synthax & Starr Z-Board), Jim Cox (keyboards) and Jimmy Johnson (bass). 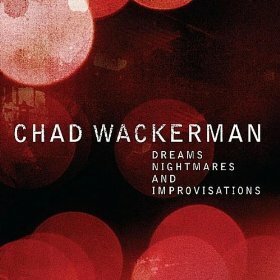 This is Chad’s fifth solo album, others include: Forty Reasons (1991), The View (1993), Scream (2000) and Legs Eleven (2004). What I’ve always appreciated about Chad’s work (having seen him perform live a few times) is that he is technically precise, versatile, quick-handed, and uses varied dynamics with aplomb. Some might rush out to buy this album as another Allan Holdsworth trio album, but that’s not at all what this album is. Aside from his solo pieces, Chad either trios as an equal with Holdsworth and Johnson or Cox and Johnson, and one duo piece with Cox. This album displays a variety of styles from Funk, hard-driving Fusion, mellow instrumental Jazz, and brooding Progressive. Chad provides a solid backbone for the trios and punctuates each piece with deftly placed accents including tone and color often missing from percussionists who play purely for speed and to impress. Wackerman’s work is energetic yet not overpowering to his trio-mates, and this is evident in tracks like “A New Day” where the percussion introduces Holdsworth’s broad chordal backdrop and is followed by Johnson’s steady bass and Holdsworth’s Synthax solo with synchopated off-beat fills by Wackerman. I don’t find the Synthax to be nearly as expressive (melodically) as Holdsworth’s guitar solos, but that’s a matter of taste, I suppose. “Star Gazing” is a far better piece featuring Holdsworth’s Synthax—broader fabric of sound. Some pieces begin with a drum solo, such as “Edith Street”, but again Wackerman moves quickly aside for his trio players’ contributions. One nice aspect to this album is that it does display a wider variety of guitar sounds from Holdsworth and Cox’s keyboards add edginess, depth and an even broader sound. The album hits its stride with “The Fifth”, which starts solidly and languidly moves through a variety of textures and fills on percussion, guitar and bass—a really fantastic piece written by Wackerman with lyrical solos by Johnson and Holdsworth. “Waterways” is a floating tonal exploration. “The Billows”, another self-penned has more of the classic sound and feel of so many works that Wackerman-Holdsworth-Johnson have recorded previously. It also includes a brief and effective drum solo. Solo drums return on “Rapid Eye Movement” and great care has been taken with how the drums and cymbals are mic-ed, it’s a very spatial mix, befitting the title, and again, not overly flashy. “Brain Funk” has a visceral organ sound provided by Cox and this is a piece where Chad drives the beat—it has a great feel as does “Two For Ya”. To close the album with a subtlety I appreciate, “Invisible” is a suspended arhythmic other-worldly exploration. This is an excellent album. It’s well-recorded and engineered across two studios and a really pleasurable listening experience. This entry was posted on March 24, 2012 by wajobu. It was filed under Uncategorized and was tagged with Allan Holdsworth, Chad Wackerman, Drums, Frank Zappa, Fusion, Instrumental, jazz, Jim Cox, Jimmy Johnson, Percussion.